Delicious sauces are a great way to get kids to eat their not-so-favorite vegetables. Cece will eat broccoli, sweet potatoes and spinach plain with no problem. But cabbage and brussel sprouts are a different story. Here are some nice toppers to encourage your little one to devour his or her dinner. If you top your noodles and broccoli with cheese sauce, you’ll want to try this healthy alternative. It is super creamy and when paired with noodles, it is reminiscent of homemade mac n’ cheese. 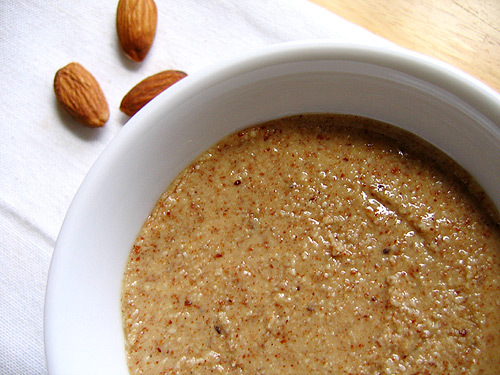 It is high in protein and monounsaturated fat, providing your family with the ultimate nourishment. I served it over brown rice noodles and broccoli tonight. It also makes a nice dip for raw veggies! Place all ingredients in a food processor or blender. Process until smooth and creamy. Pour into a small saucepan and whisk over medium heat for 1-2 minutes. This sauce is a great tofu- topper. Simply bake tofu at 350 F for 20 minutes. Top with the sauce and then bake for another 12 minutes. It is also great for stir-fries. 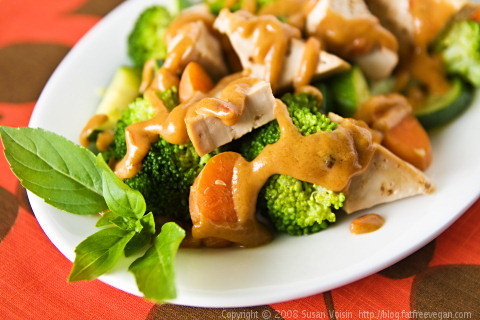 I like to saute cabbage and top with the peanut sauce. It adds protein and healthy fat to the meal. Place ingredients in a bowl and mix together. Drizzle over veggies or tofu. This is amazing! The peanut sauce (above) is a staple in our house, so this is a nice, equally delicious alternative. Try it over green beans, tofu, tempeh or stir-fries. Combine all ingredients in a bowl and mix together. Transfer to a small skillet and heat and stir over low heat for 3-4 minutes. Drizzle over veggies. I love pesto! It is typically thought of as a topper for noodles, but I like to make pesto quesadillas with it. Spread some pesto on brown rice tortillas, add some crumbled goat cheese, spinach and black beans. Your family will devour these! And they are so easy- great for a quick and healthy week-night meal. Place basil and garlic in a food processor and blend until finely chopped. Add the remaining ingredients and process until it is a smooth paste.